SAN FRANCISCO, April 19, 2018 — Castlight Health, Inc. (NYSE: CSLT), a leading health benefits platform provider, today released its State of Digital Health: 2018 Annual Report, a comprehensive survey on how employers and employees interact with health and wellness programs, including digital therapeutics, telemedicine, and other apps, tools, and services. 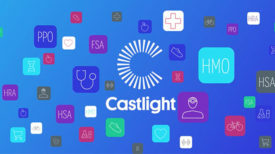 To complete the first-of-its-kind report, Castlight funded and analyzed a survey by Employee Benefits News with nearly 350 U.S.-based large employers — and more than 1,000 employees — about engagement, satisfaction, and ROI of digital health tools. The report found that all of employers’ most commonly offered digital health benefits address health issues that employees rarely report as top health goals. Employers continue to invest in solution categories that they themselves acknowledge have the weakest business case or lowest engagement. These include Employee Assistance Programs (EAPs), Smoking Cessation Programs, and Health Risk Assessments which are widely implemented, but fall short of employers’ expectation for their impact on employee health and satisfaction. Employees are finding the digital health solutions that meet their health goals, with or without their employer. Employees are using technology to help them lose weight and sleep better — two of the top three health goals employees identified in the survey — and are 5.9 times and 5.8 times more likely, respectively, to access that technology directly, rather than through their employer. Overall, employees are 1.8 times more likely to consume digital health directly, rather than accessing through their employer. The report details how employers and employees perceive digital health and benefits, how their perspectives align or differ, and the key opportunities for employers implementing digital health. 2018 will be a breakout year for financial wellness. With 23 percent of employers surveyed committed to offering, or considering offering, a financial wellness solution in 2018, financial wellness is the fastest growing solution for 2018. Employers are incorporating a number of digital health solutions that meet discreet health needs into their benefits programs. The average employer offers 14 solutions, 9 procured from a health plan, 5 from a third-party vendor. Employers with 15,000 or more employees are even more likely to offer additional solutions, with 30 percent offering 20 or more solutions. Employees have no shortage of digital health enthusiasm. With 98 percent of employees having utilized at least one form of health technology, the demand taps into all generations. No matter the generation, all demand digital health. Overall, every generation is using digital health tools. Currently, millennials are only 1.2x more likely to use digital health solutions than Gen X’ers or Boomers. All generations share some of the same health goals. Millennials, Baby Boomers, and Gen X’ers all named losing weight, reducing stress, and sleeping better as top health goals. Employees are open to more skin in the game. More than 50 percent of employees currently using a children’s health and obesity tool, pregnancy program, smoking cessation program, or diabetes management tool would be willing to contribute more than $1 per month. More than 20 percent of employees currently using a chronic condition management tool, mental health program, gym, weight loss, or retirement savings solution would contribute more than $6 per month. The full results of the survey can be found here. Castlight is launching a nationwide roadshow to explore this research with experts from digital health solutions, major employers, and benefits consultants. The first four events will be held in New Jersey (May 8), Northern Virginia (May 10), Dallas (May 17), and Chicago (May 22).